On March 13, 2019, Arctic sea ice likely reached its maximum extent for the year, at 14.78 million square kilometers (5.71 million square miles), the seventh lowest in the 40-year satellite record, tying with 2007. And, yet, the permafrost is thawing...strange is that. 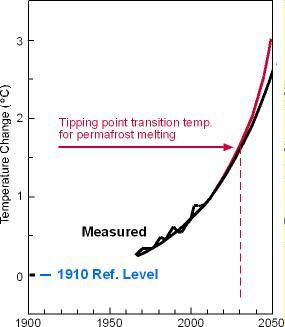 There is no prove permafrost is thawing everywhere. Maybe in certain locations it happens but that is natural. It is natural for some places to thaw and other places to freeze. Nature is not static. It is always in flux in different locations. And even if in some locations permafrost is thawing the trend is increasing ice in general as we head into the next little ice age. Of course there is proof, there are measurements done by scientists over the decades. Shakhova notes that Earth's geological record indicates that atmospheric methane concentrations have varied between about .3 to .4 parts per million during cold periods to .6 to .7 parts per million during warm periods. Current average methane concentrations in the Arctic average about 1.85 parts per million, the highest in 400,000 years, she said. Concentrations above the East Siberian Arctic Shelf are even higher. Shakhova and Semiletov hold joint appointments with the Pacific Oceanological Institute, part of the Far Eastern Branch of the Russian Academy of Sciences. Their collaborators on this paper include Anatoly Salyuk, Vladimir Joussupov and Denis Kosmach, all of the Pacific Oceanological Institute, and Orjan Gustafsson of Stockholm University. That's not proof. There's only 1 agency that measure sea ice and that is National Snow & Ice Data Center. They use satellites since 1979. We are discussing measuring permafrost (and melting), read the article please. Okay but the sources you posted is not authority and they do not have the equipment to do that. And the blog is a future telling activism blog, not a science blog. See the Science Daily article then. Science Daily ain't authority either.